This new product is both an alarm pressure switch and an AED riser! This cabinet pressure switch/riser activates your AED cabinet's alarm (and/or strobe light, if equipped) once your AED is removed from the cabinet. And acting as a riser bracket, it raises the AED off the cabinet floor so it displays very nicely in the cabinet window. Usually, cabinet alarms are activated when the door is opened. But this convenient add-on option gives you a great alternative by activating only when the AED is removed. The quick-connect cord plugs into your cabinets current alarm in just seconds- no wiring experience needed. Simply unplug the door alarm switch wire and replace with the pressure switch cable in its place. Then, if you wish to use the door switch in the future, they simply switch the plugs back. Plus, the activation switch on the riser lies flat so it does not interfere by tilting the AED on display. Please note: Your present cabinet must contain either an alarm or strobe/alarm combination and be a cabinet model with a part number which starts with "AMP". Please contact us at 800-544-0048 if you need assistance. May not work with other manufacturer or specialty cabinet brands. 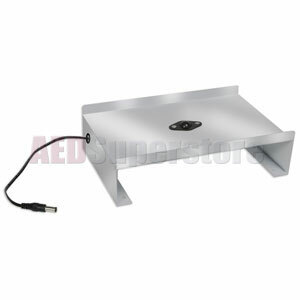 This Stainless Steel Riser Bracket works best for Stainless Steel 'Surface Mount' AED Wall Cabinets. Many recessed and semi-recessed wall cabinets have a painted white finish interior tank (see AMP1910).